If you apply XMP presets to an image in Lightroom Classic 7.3 that uses an older B&W profile (such as “Camera Default BW” or “Adobe Standard BW”), Lightroom will change the photo’s profile to Adobe Color. This bug only affects Lightroom Classic 7.3, and Adobe is working on a fix. To begin, make sure to download the latest version of the Prolost Presets you wish to install. Verify that the version of Lightroom you have is supported by the presets. This installation process involves copying folders of presets into a specific folder on your system drive. We’ll start by locating the folder we're copying to. Open Preferences (on Mac that’s Lightroom → Preferences, on Windows it's Edit → Preferences). Within the folder that opens, double-click the Develop Presets folder. This is the folder that you'll copy the preset folders into. In the folder you unzipped, open the For Lightroom 6 folder. There, select all the folders that start with +L, and drag them into the Develop Presets folder. You should now have multiple folders beginning with “+L” in your Develop Presets folder. Now launch Lightroom and go to the Develop module. You should see the Preset Groups in the left panel beginning with the +L prefix. What happens to my Prolost Presets when I upgrade to Lightroom Classic 7.3? How are Presets and Profiles shared/synced among Lightroom Classic, Lightroom CC, and Photoshop? What's the Difference Between Lightroom Presets and Profiles? What changed about Presets with Lightroom Classic 7.3 and Lightroom CC 1.3? How do I check which version of Lightroom I have? When you upgrade Lightroom Classic to version 7.3, your presets get converted to a new format, and these new copies are moved to a new location. Your original presets (with the .lrtemplate extension) are left in place for compatibility with previous version of Lightroom. They get prepended with a ~ so Lightroom knows not to convert them again. The ~ does not show up in Lightroom. The new presets are converted to the .xmp format that’s compatible with Camera Raw in Photoshop, and Lightroom and Photoshop share a common location for these presets, meaning that your preset collection will be the same in both apps. Your Prolost Presets will be available in Photoshop, and any presets you create will be available in both Photoshop and Lightroom Classic. This conversion process happens automatically, and only once, so there should be no need to re-install Prolost Presets after upgrading to Lightroom Classic 7.3 or greater. And Photoshop too, while we're at it. Prolost Profiles appear in the Profiles browser introduced in Lightroom Classic 7.3. On Mac, you may need to press ⌘ + G and paste the above path into the Go To sheet, as the Library folder may not be visible. Decompress the zip file you downloaded from the Prolost Store. In the folder that appears, locate the For Lr Classic & Photoshop folder. Within that folder you will see the profile files that end with .xmp. Select all of these .xmp files and copy them to the Settings folder you located above. Opening the Profile browser in Lightroom Classic 7.3. Launch Lightroom and enter the Develop module. At the top, you should see the profile setting for your photo. You can either select Browse from this menu, or click on the small grid of four rectangles to the right. The Prolost Profiles will be there among the default set. In Photoshop CC, the same settings are found in the Basic tab of the Camera Raw window. Before following these instructions, make sure you’re using the most up-to-date version of Lightroom CC. Decompress the zip file you downloaded from the Prolost Store in a convenient place, such as your Downloads folder. In Lightroom CC, press E to reveal the Edit controls. Twirl open the Profile section of the edit controls. It’s at the very top. Navigate to the Prolost Profiles folder that you decompressed. In a folder called For Lightroom CC, find a zip file called Import Into LrCC.zip. Select that zip file and press Import. The Profiles should appear after a moment. Lightroom CC 1.3 and Lightroom Classic 7.3 were released in April 2018, and changed how presets and profiles are saved and stored. Lightroom CC 1.4 was released in June 2018, and enabled syncing of Presets and Profiles with Lightroom CC for iOS and Android. Lightroom Develop/Edit presets are now saved in the .xmp format that's compatible with Camera Raw in Photoshop, and Lightroom Classic and Photoshop share a common location for these presets, meaning that your preset collection will be the same in both apps. 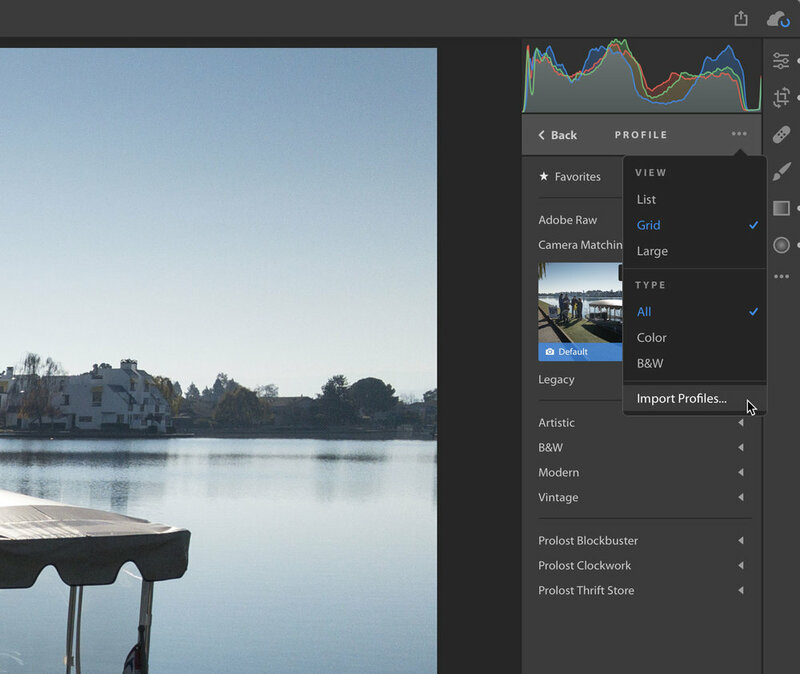 Presets and profiles in Lightroom CC 1.4 and later are synced with your Creative Cloud account, and should not be administered from outside the Lightroom CC app. The Prolost Presets and Profiles you install in Lightroom CC Desktop will be available in Lightroom CC for iOS and Android. This issue affects people who have the Prolost Graduated Presets installed in Lightroom 7.2 or earlier, and then update to Lightroom 7.3. The first time you launch Lightroom Classic 7.3 after updating, all of your presets are converted from .lrpreset format to .xmp (more info here). The solution is to manually uninstall the converted presets, and re-install the updated versions from the Prolost Store. This installation process involves copying folders of presets into a specific folder on your system drive. We'll start by locating the folder we're copying to. Move these folders to a safe location, such as your Desktop. Decompress the zip file you downloaded. In the folder that appears, locate the For Lightroom Classic 7.3+ folder. Within that folder you will see the preset folders that begin with +L. Launch Lightroom. The replaced presets should appear in the Develop module. To confirm that they work, verify that Blockbuster Cyan Max gives your image a blue/cyan tint. When you’ve confirmed that the new presets work, you can delete the five preset folders from your Desktop. Lightroom Develop Presets are shortcuts to applying Develop/Edit settings. A preset might be as simple as setting exposure, or as complicated as adding a complete look to a photo, or even local adjustments, which can create cool effects like the Prolost Light Leaks. The Prolost Graduated Presets are special presets arranged in graduated groupings, allowing you a nice visual way to perform common image editing tasks. Most Prolost presets support Lightroom 4 and up, although some require more recent versions. Lightroom has long supported “Camera Profiles,” but they were not very visible, and used mostly to match camera JPEG output. With Lightroom Classic version 7.3, and Lightroom CC version 1.3, Profiles got a nice visual browsing system, and a differentiation between Camera Profiles and “Creative Profiles,” such as the Prolost Profiles, which make your photos look great regardless of originating camera. Some Creative Profiles support an Amount slider, allowing you to choose how much of the Profile’s visual adjustment to apply to your photo. The installation process varies from version to version, and depending on whether you're installing Presets or Profiles. To begin, make sure to download the latest version of the Prolost Presets you wish to install. On Mac, you may need to press ⌘ + G and paste the above path into the Go To sheet, as the User Library folder may not be visible. Select all of these +L folders and copy them to the Settings folder you located above. Launch Lightroom. The presets should appear in the Develop module. In Photoshop, the Presets will appear in the Presets tab of the Camera Raw window. Lightroom CC 1.3 and Lightroom Classic 7.3 were released on April 3, 2018, and marked a change in file format for Lightroom Presets. Prior to this release, Lightroom Develop Presets had the .lrtemplate file extension, and were stored in a Lightroom-specific location. As of Lightroom CC 1.3 and Lightroom Classic 7.3, Lightroom Develop Presets have the .xmp extension, and are compatible with Adobe Camera Raw in Adobe Photoshop. Presets in Lightroom Classic 7.3 and later are stored in the same location as Adobe Camera Raw, so installing the Prolost Presets for Lightroom Classic now means that they’re installed for Photoshop as well. If you have .lrtemplate presets installed and then update to Lightroom Classic, your presets will automatically be converted to .xmp and relocated to the new folder. The .lrtemplate presets are left in place for compatibility with older versions. Presets in Lightroom CC 1.3 and later are stored within the Library (.lrlibrary) file, and should not be administered from outside the Lightroom CC app. To check which version of Lightroom you're running, choose Help → System Info. To see if you have any updates available, choose Help → Updates. For a more information, including which versions of Lightroom are current, check out Adobe's help page on Lightroom versions and updates.